Approximately 45 lbs. (20kg) scope and accessories (not including counterweights), depending on length. 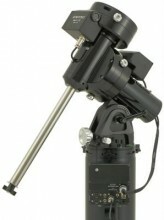 Will accommodate Astro-Physics and similar fast refractors up to our 160mm f7.5 StarFire EDF, 8" - 11" SCT's and 6" - 8" Maks. These are only guidelines. Some telescopes are long for their weight or very heavy for their size and will require a larger mount. Remember also that imaging requirements are more rigid than visual observation. Counterweight Shaft 1.125" diameter X 14.5" long, 4.1 lbs. (29mm X 368mm, 1.9kg) This shaft uses the same 6 lb. and 9 lb. counterweights that were used with the 400, 600 and 800 series mounts. 1.875" diameter X 10.70 " long, 7.7 lbs. (48mm X 273mm, 3.5kg) This shaft is the same diameter as the shaft for the 900 and 1200 mounts and uses the same counterweights as well as a 5 lb. counterweight produced especially for the Mach1GTO. Longer sizes and an extension are available. Requires Safety Stop (M12676). Click the button below to add the Astro-Physics Mach1GTO Mount to your wish list.